Heavy-tailed distributions are typical for phenomena in complex multi-component systems such as biometry, economics, ecological systems, sociology, web access statistics, internet traffic, biblio-metrics, finance and business. The analysis of such distributions requires special methods of estimation due to their specific features. These are not only the slow decay to zero of the tail, but also the violation of Cramer’s condition, possible non-existence of some moments, and sparse observations in the tail of the distribution. The book focuses on the methods of statistical analysis of heavy-tailed independent identically distributed random variables by empirical samples of moderate sizes. 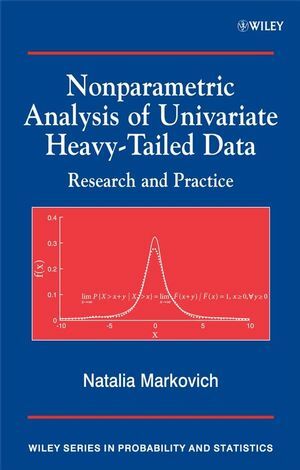 It provides a detailed survey of classical results and recent developments in the theory of nonparametric estimation of the probability density function, the tail index, the hazard rate and the renewal function. Both asymptotical results, for example convergence rates of the estimates, and results for the samples of moderate sizes supported by Monte-Carlo investigation, are considered. The text is illustrated by the application of the considered methodologies to real data of web traffic measurements. Having been the Leading Scientist at the Institute of Control Sciences for the last eleven years, Dr Markovich has had much experience in this area. An extremely active member of the statistical community, she has presented many seminars and invited talks, as well as being involved in numerous international research projects. She has published over 50 articles and has written chapters in two books, for Springer-Verlag and Elsevier. 1. Definitions and rough detection of tail heaviness. 1.1 Definitions and basic properties of classes of heavy-tailed Distributions. 1.2.1 Estimators of a positive-valued tail index. 1.2.2 The choice of k in Hill's estimator. 1.2.3 Estimators of a real-valued tail index. 1.2.4 On-line estimation of the tail index. 1.3 Detection of tail heaviness and dependence. 1.3.1 Rough tests of tail heaviness. 1.3.2 Analysis of Web traffic and TCP flow data. 1.3.3 Dependence detection from univariate data. 1.3.4 Dependence detection from bivariate data. 1.3.5 Bivariate analysis of TCP flow data. 2. Classical methods of probability density estimation. 2.1 Principles of density estimation. 2.2 Methods of density estimation. 2.3 Kernel estimation from dependent data. 2.3.1 Statement of the problem. 2.3.2 Numerical calculation of the bandwidth. 2.3.3 Data-driven selection of the bandwidth. 2.4.1 Finance: evaluation of market risk. 3.1 Problems of the estimation of heavy-tailed densities. 3.2.1 Nonparametric estimation of the density by structural risk minimization. 3.2.3 Web data analysis by a combined parametric-nonparametric method. 3.3 Barronâ? ?s estimator and Ï?2-optimality. 3.4 Kernel estimators with variable bandwidth. 4. Transformations and heavy-tailed density estimation. 4.1 Problems of data transformations. 4.2 Estimates based on a fixed transformation. 4.3 Estimates based on an adaptive transformation. 4.3.2 Analysis of the algorithm. 4.4 Estimating the accuracy of retransformed estimates. 4.6 Accuracy of a nonvariable bandwidth kernel estimator. 4.7 The D method for a nonvariable bandwidth kernel estimator. 4.8 The D method for a variable bandwidth kernel estimator. 4.8.2 Application to Web traffic characteristics. 4.9 The Ï?2 method for the projection estimator. 5. Classification and retransformed density estimates. 5.1 Classification and quality of density estimation. 5.2 Convergence of the estimated probability of misclassification. 5.4 Application of the classification technique to Web data analysis. 5.4.2 Web data analysis by traffic classification. 6. Estimation of high quantiles. 6.2 Estimators of high quantiles. 6.3 Distribution of high quantile estimates. 6.4.1 Comparison of high quantile estimates in terms of relative bias and mean squared error. 6.4.2 Comparison of high quantile estimates in terms of confidence intervals. 6.5 Application to Web traffic data. 7. Nonparametric estimation of the hazard rate function. 7.1 Definition of the hazard rate function. 7.3 Numerical solution of ill-posed problems. 7.4 Estimation of the hazard rate function of heavy-tailed distributions. 7.5 Hazard rate estimation for compactly supported distributions. 7.5.1 Estimation of the hazard rate from the simplest equations. 7.5.2 Estimation of the hazard rate from a special kernel equation. 7.6 Estimation of the ratio of hazard rates. 7.7 Hazard rate estimation in teletraffic theory. 7.7.1 Teletraffic processes at the packet level. 7.7.2 Estimation of the intensity of a nonhomogeneous Poisson process. 7.8 Semi-Markov modeling in teletraffic engineering. 7.8.2 Estimation of a retrial process. 8. Nonparametric estimation of the renewal function. 8.1 Traffic modeling by recurrent marked point processes. 8.2 Introduction to renewal function estimation. 8.3 Histogram-type estimator of the renewal function. 8.4 Convergence of the histogram-type estimator. 8.5 Selection of k by a bootstrap method. 8.6 Selection of k by a plot. 8.8 Application to the inter-arrival times of TCP connections. A Proofs of Chapter 2. B Proofs of Chapter 4. C Proofs of Chapter 5. D Proofs of Chapter 6. E Proofs of Chapter 7. F Proofs of Chapter 8. List of Main Symbols and Abbreviations. Provides comprehensive coverage of a growing area of research. Presents a good balance of theory and real world applications. Uses examples drawn from finance and from internet traffic management to illustrate the concepts. Presents a detailed survey of classical results alongside recent developments in the theory of nonparametric estimation of the probability density function, the tail index, the hazard rate and the renewal function. Equips the reader with the knowledge to carry out basic and advanced statistical analyses of heavy-tailed data. Accompanied by a website hosting exercises and solutions to problems presented within the book.